Without doubt, the best read of the year was Rana Ayyub’s Gujarat Files, a result of the young Indian journalist’s investigation into the extrajudicial killings of Sohrabbudin and others and its cover up by a network of government functionaries, civil and police officials and the majority of the mainstream media. Indeed, the key change in the last few years has been the throttling of the media as it has become corporatized and aligned with the government in power. Ayyub took on the identity of an Indian American filmmaker to gain access to middle and senior level officials. Her own employer recalled her just when she was about to get direct access to the Chief Minister of Gujarat (and now the Prime Minister of India), Narendra Modi. The key person allegedly involved in the execution of the extrajudicial killings by the police was the then Home Minister of Gujarat and the current national president of the ruling Hindu right-wing party, the Bharatiya Janata Party. It’s not just the courage of the journalist and the depth of her findings but also the breezy narration, which reads like a crime thriller, that makes Gujarat Files such an engrossing read. In more open times, a book like this would have shaken the government. On a related note, the 84 page booklet The Amit Shah School of Election Management by another young journalist Prashant Jha provides a number of insights on how the far right Modi- Shah election machine continues to roll on- with the BJP being the ruling party in 18 out of 29 states in India this year. Sometimes time flies, and sometimes it stands still. Before I knew it, 10 years of writing the book annual digest on this blog had passed. Reading them makes me nostalgic and occasionally rekindles my interest. At times, my own words sound surprisingly unfamiliar. Taking a view of a decade gives me a perspective that is not discernible when I look back at the end of each year. Quite a lot of my reading has been at the blurry edges of literature and politics, between paradise and labyrinths. These labyrinths traverse across many lands and times. They have taken me to to places made familiar by past reading- Russia, Hungary, various countries in South America — all places I have visited only via books. In the last decade, a few new countries surfaced on my literary map — Guatemala, Nicaragua, Bulgaria, Norway and Bolivia. But nowhere feels as familiar a home as Russia does when it comes to literature. The universal themes of Russian literature make us all feel Russian at heart. For me, this started during adolescence and continues to be of interest, though less intensely, in the decades since. The reason isn’t too far to seek; the classical Russian novel was more than a work of literature. More often than not, it was a means for communicating ideas and philosophical reflections. There is also a remarkable continuity of themes, what with Russian writers taking up, as it were, themes from a previous novel by a different writer and forging ahead on the trail. . If Latin American literature is an Amazonian river, Russian literature is like a constellation providing direction to lost voyagers– as we all are at some point or the other. It takes some time for the film to sink in, but when it does, Anhey Ghorey Da Daan (Alms for a Blind Horse) has mastery written all over it. That Anhey Ghorey belongs to niche contemporary cinema is not insignificant, even more striking is that the film is in Punjabi. This is a dissonance- the film in every way is far removed from what one expects from a Punjabi movie, or even the Hindi movies that Punjabis make. Isn’t any movie in Punjabi about a Jatt on a revenge spree? Isn’t every Hindi movie with Punjab in the background about lush green fields swaying with bright mustard crops? If not about the big fat Punjabi weddings, isn’t it supposed to be about the valour of militant patriots like Bhagat Singh? Based on a novel of the same name by Gurdial Singh, Anhey Ghorey presents a contrarian perspective- something that isn’t found in the Bollywoodized versions of Punjab. The story is not about the revenge of the Jatts, it is not about a militant valour either. It is a life that at best is stoic, and at its worst is impassive in the face of hardships. 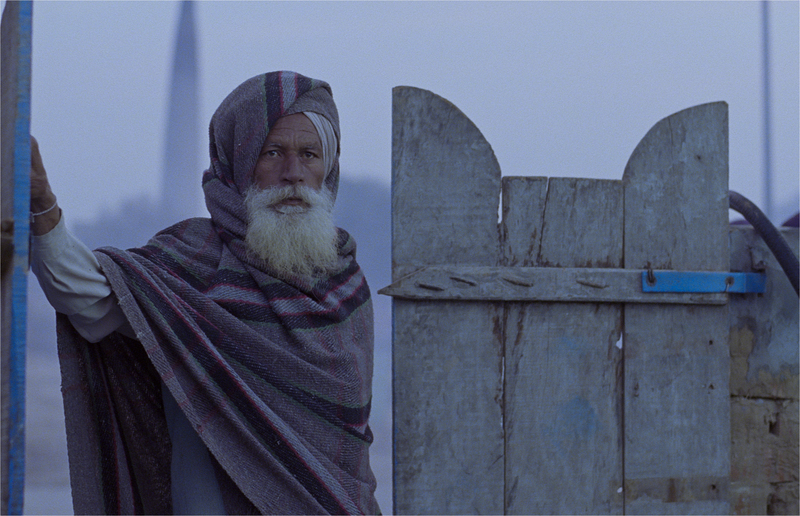 It shows one day in the life of a Mazhabi Sikh family that lives on the fringes. The characters don’t jump into a frenzy of song and dance every few minutes- instead they eek out a precarious existence against a a volley of brutal attacks on their daily existence. A very comprehensive essay on The Dreyfus Affair that split French opinion in the 1890s- 1900s. (wikipedia link) and which in literature is most remembered for the references it finds in Proust’s works. I found the following observation to be quite insightful though it is tangential to the topic. This year’s Nobel laureate Le Clézio gives an impassioned Nobel Prize lecture, in a sense taking off from where Doris Lessing had left it last year. He quotes a passage from Stig Dagerman that influenced him as a writer and touches on many themes including a call for re- claiming the word “globalization” as well as for reclaiming a place for literature in face of the audio and visual media. Among others, he dedicates his lecture to the Mauritian Hindi writer Abhimanyu Unnuth, Qurratulain Hyder (for Aag Ka Darya) and the Mexican writer, Juan Rulfo. Mukul Kesavan in the Outlook in a superb review of an anthology of Tamil Pulp fiction, wonders why India apparently lacks popular ‘pulp’ fiction. This has something to do with the narrowness of the social class that reads English for pleasure in India. But even within this sliver, publishers seem to aim their books at the tiny minority that’s willing to be bored witless in the name of art. The idea of fiction as guiltless diversion where the reader turns pages in search of reliable narrative pleasure, doesn’t seem to exist. This is because all the popular fiction produced in India is published in Indian languages. Which brings me to this anthology, a riveting collection of stories written by 10 bestselling Tamil writers. They are real professionals who make Stephen King and Barbara Cartland look like amateurs. Indra Soundar Rajan, who is represented here by a splendid story on the theme of reincarnation, has written 500 short novels. If that sounds like fiction manufactured on an industrial scale, wait till you get to Rajesh Kumar, who has published 1,250 novels and 2,000 short stories in 40 years. That day, too, the workless man stood on a side. A ribbon of many different colours was made. Ever since, it takes the girl a long time to tie her hair into a plait. Chores are left undone, time passes by. On the other hand, with time, big gaps started appearing in the working people’s heaven. Tears and songs filled those gaps. The wrong man was brought to the meeting. His coloured headgear and waistband were enough to tell everyone that a grave mistake had been committed. The elderly chairman became a little abstracted. This was the first time he had witnessed something that had no meaning at all.